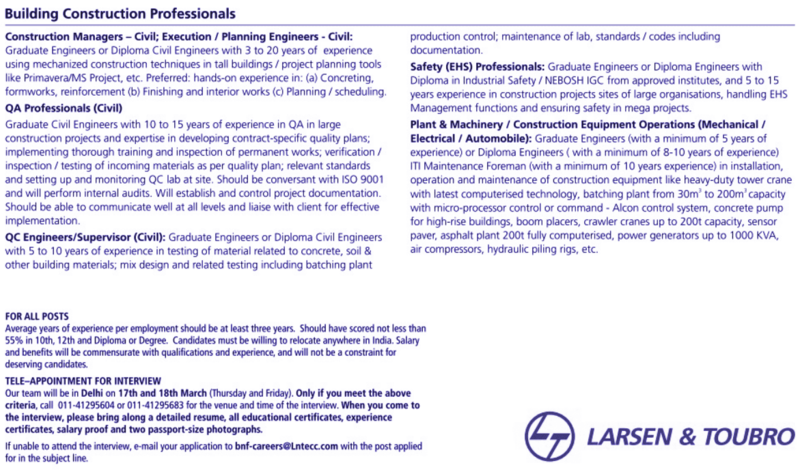 Graduate Engineers or Diploma Civil Engineers with 3 to 20 years of experience using mechanized construction techniques in tall buildings / project planning tools like Primavera/MS Project, etc. Preferred: hands-on experience in: (a) Concreting, formworks, reinforcement (b) Finishing and interior works (c) Planning / scheduling. with 5 to 10 years of experience in testing of material related to concrete, soil & other building materials; mix design and related testing including batching plant production control; maintenance of lab, standards/codes including documentation. 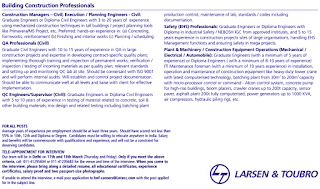 Graduate Engineers or Diploma Engineers with Diploma in Industrial Safety / NEBOSH IGC from approved institutes, and 5 to 15 years experience in construction projects sites of large organisations, handling EHS Management functions and ensuring safety in mega projects. Graduate Engineers (with a minimum of 5 years of experience) or Diploma Engineers (with a minimum of 8-10 years of experience) ITI Maintenance Foreman (with a minimum of 10 years experience) in installation, operation and maintenance of construction equipment like heavy-duty tower crane with latest computerised technology, batching plant from 30m' to 200m'capacity with micro-processor control or command - Alcon control system, concrete pump for high-rise buildings, boom placers, crawler cranes up to 200t capacity, sensor paver, asphalt plant 200t fully computerised, power generators up to 1000 KVA, air compressors, hydraulic piling rigs, etc. Average years of experience per employment should be at least three years. Should have scored not less than 55% in 10th, 12th and Diploma or Degree. Candidates must be willing to relocate anywhere in India. Salary and benefits will be commensurate with qualifications and experience, and will not be a constraint for deserving candidates. certificates, salary proof and two passport-size photographs. for in the subject line.